The District Department of Transportation (DDOT) held its public meeting to discuss the proposed M Street NW cycle track, also called a protected bike lane, Wednesday, May 15 at the West End Public Library. 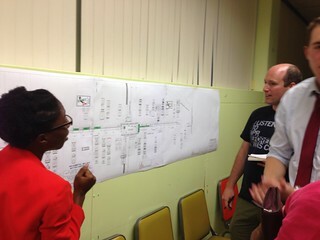 Most of the discussion involved how the proposed cycle track would impact those who attend the 175 year-old Metropolitan African Methodist Episcopal church (@MetropolitanAME) in the1500 block of M Street. The second floor meeting room of the West End Library appeared to be near capacity with almost every seat taken and several standing when DDOT staff comprise of Associate Director Sam Zimbabwe, Bicycle Program Coordinator James Sebastian and Bike Program Planner Mike Goodno began their presentation of the project. The presentation initially discussed certain functional highlights of the bike lane including the integration of automobile turning lanes and protected green sections for the safety of bicyclists. DDOT also discussed how it planned to integrate what it learned from its installation of L street and 15th street protected lanes into the design of M Street. This would include green painted bike boxes in areas that come in contact with automotive traffic and bicycle-priority signalization at the complicated intersection of Rhode Island and Connecticut Ave. and M Street. Also, DDOT staff explained because of certain dynamics of the street and due to what the agency learned about the L street lanes, that the time impact of the bike lanes on automotive traffic lead to only a 2 to 7 minute increase in projected transit time. 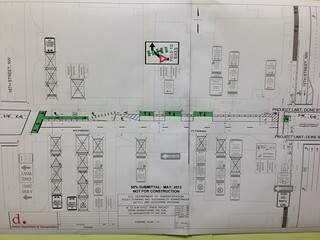 Lastly, DDOT would resurface the street and remove duplicate or confusing signage. Shortly after the DDOT presentation, a few members of public complained that the construction of the M street bike lanes was premature given that all of the data was not yet collected. Also, there was concern that the estimated $150,000 bike lane project takes money away from other more worthwhile projects like the renovation of the library. In addition, a business owner on the 1800 block of M Street voice opposition to the lanes sighting concern that the lanes would reduce parking in front of his business and add to the heavy evening traffic turning on 19th street. When the members of the Metropolitan AME church, located at 1518 M Street, began their questioning of the project, one of the repeated questions was why the District had not actively engaged the church before the plans were developed. While DDOT posted information on websites and contacted some Advisory Neighborhood Commissioners, some church attendees stated that DDOT had not personally contacted them at the church. Specific concerns involved the apparent removal of Sunday-only angled parking, the safety of the elderly crossing bike lanes (church members believed that the lanes lead to more crashes with pedestrians) and the overall traffic impact of adding lanes along the corridor. While the DDOT staff later admitted that he misspoke, parishioners appeared to become agitated when asked one of its members ask if the installation of the lanes was "a done deal", or would proceed regardless of the the outcome of the meeting. DDOT staff essentially said that the lanes would happen, incorrectly implying that comments or suggestions would not be included. Members of the bicycling community were also in attendance, however in what appeared to be smaller numbers. Most of their comments address the need for a westbound route that safely moved bicycles and that the overall impact of adding bicycles would produce a healthier population less reliant on automobiles, which have a negative environmental impact. Some also voice support for the project, explaining that it will help mitigate automobile traffic in the long-term, is a needed link for bicyclists and trail users on the east side of the District and creates an opportunity for businesses to reach new customers. The Washcycle discusses certain comments made at this meeting with more specificity in its blog. Actual location of proposed lanes on the 1500 block. While there was much discussion about the actual or perceived impact of the bike lanes on church goers, DDOT may not have clearly articulated which side of the street the bike lanes would be installed. On the map below, the church is on the south side of M street and bike lanes pass along the north side. It appeared that most people believed that the bike lanes would pass directly in front of the church, creating a danger for the elderly, according to some speakers. Please click to see a Google street view image of the relationship between the lane and the church. Removal of angle-in parking along the south side of M Street. The church congregation were concerned that the plan advocated for the removal of angled parking on Sundays. According to those who spoke, the church lobbied the District for three years obtain permission to angle park. They view it as both a safety measure (reduction the possibility of passengers being struck exiting cars) and a method of adding more parking spaces. Also, people were concerned that the bike lane would significantly reduce parking on this block. Accord to the presenters, approximately 3 or 4 spaces would be removed to accommodate a right turning motorists. Confusion regarding use of street. A few in the audience were concerned that the new signage, signalization, configuration and street markings would be confusing and potentially lead to crashed. Implementation speed. Construction is to begin sometime in August to be completed by late fall. Some felt that because of the concerns discussed in the meeting and that survey and other data has not been fully complied, that DDOT should delay construction. This would likely push the project to 2014 due to the likelihood of unfavorable winter weather conditions. Draft Discussion Alternative 1: Keeping the angled parking. The presented plan removed angled Sunday-only parking because automobiles parked in that way infringe on the only travel remaining motorist travel lane. Angled parking allows more cars but potentially adds doubles the with of parking lane from 11 to 22 feet. Draft Discussion Alternative 2: Make a travel lane a sharrow. Certain sections of this block would contain sharrows, allowing for more parking. DDOT stated that it will continue to meet with the church and possibly Advisory Neighborhood Commissioners of that location. 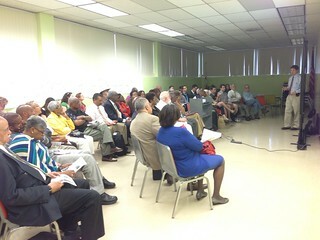 DDOT plans to hold an additional public meeting later this year. BAC would like to know what you think about M Street and this issue. Please let us know by leaving comments below or contacting us on twitter @DCBAC.